Part Used & Method for Pharmaceutical Preparations: The entire plant, when it is ripe, is gathered, dried in the sunshine and cut into pieces. Functions: 1. To promote diaphoresis and release the exterior; 2. To resolve dampness and harmonize the spleen and stomach; 3. To promote water metabolism and release edema. 1. Wind-cold exterior syndrome occurring in the summer season manifested as chills, fever, headache, absence of sweating, abdominal pain, vomiting and diarrhea. Elsholtzia (Xiangru) is used with Hyacinth bean (Biandou). 2. Edema and dysuria. 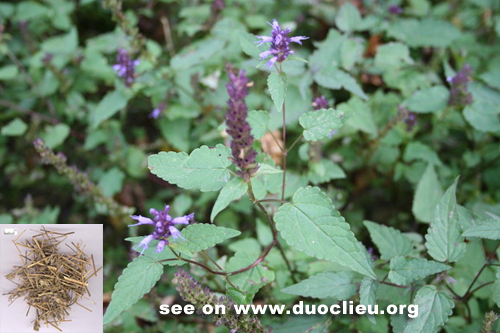 Elsholtzia (Xiangru) is used with White atractylodes (Baizhu). Cautions & Contraindications: This herb is contraindicated in deficiency exterior syndrome with sweating.